How do you best help your nursing students link their theoretical and practical learning? Offer them not only a wealth of relevant scholarly publications, but also non-traditional multimedia sources of information that help demonstrate "nursing in practice," all from a single dedicated resource. ProQuest Nursing & Allied Health Source contains a large range of reliable content to help students deepen the required knowledge in the curriculum, support their coursework, and explore research topics, as well as prepare them for a variety of hospital situations. 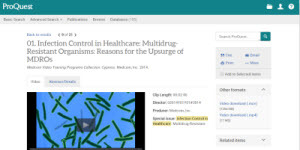 This resource offers students and researchers:-- Over 1,000 nursing training videos clips from MedCom and HCPro – helping students better “see” him/herself in the room with a patient-- Over 15,000 nursing dissertations representing numerous in-depth research subjects-- Over 900 nursing continuing education articles-- Over 4.7 million deep indexed images, tables and figures to help pin point relevant articles - easy to save and export into presentations and guides.-- Nursing Study Paths – recommended reading by nurse educators. -- Nurse Education Today - and many more. Don’t forget e-books! The ProQuest platform makes cross-searching possible between content in ProQuest Nursing and Allied Health Source with thousands of nursing and allied health e-books from ebrary as well. Ask for a free trial, or contact your ProQuest representative today for assistance.